We went to Casino Royale last night. I'm not a huge fan of the Bond franchise overall. I've always thought he was a little silly. I can't really take it when Bond skiis down a mountain and jumps into a plane that's flying by, kisses the villainess and shoots the villain. Then he drinks a martini, blows up the plane and uses the parachute built into his watch to escape. But, I have to say that overall I enjoyed this film. Bond is meaner, tougher, grittier and more human than in previous films. He could beat the stuffing out of all the other Bonds if you locked them all in a room. Believe it or not, it deals somewhat realisitically with the world of violence and corruption that Bond runs in. The fight scenes make you cringe, because it's not cartoon fighting. There's blood on the knuckles (and the walls, and the clothes and everywhere else). And some of the characters have actual emotions as a result of seeing the violence. And Bond, who seems cold and aloof, is recognized as being a sick individual for "not caring" about the pain and violence. Bond even has an emotional arc in the film, which is refreshing. In fact, Krista and I agreed that the first 3/4ths of the film was really, really good. Of course it all falls apart in the last act... one of those last acts where everything makes sense for the ten minutes it takes to run across the screen and then fall aparts if you reflect on it for more than thirty seconds. I had plenty of theories about how to make the last act better, but then K and I stopped at a bookstore last night and I took a look at the original novel... and they had already spruced it up considerably. I was, in fact, impressed by how far the screenwriters had taken it and fixed it up. 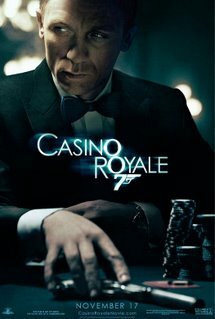 Conclusion: This is the best Bond film they've made. We could have done without several parts (the torture scene, for instance). But Bond is the most human we've ever seen him, and the part of Vesper (played by Eva Green) was a great foil for Bond. I agree wholeheartedly. Thought it got a little long at the end. Working on when I can come up to visit.